Kathmandu Valley in Nepal is remote and exotic. It's walled by nearby hills and, in the distance, by the ever snow-capped Himalayan Mountains. It is still sprinkled with villages and farms seemingly untouched by time. Although much of the capital city of Kathmandu has suffered from recent characterless urban sprawl, many intricately carved Buddhist temples and an old royal Nepalese palace survive around Durbar Square in the old section of the city. One building dates back to the 12th century - and the narrow atmospheric streets even earlier. Another local jewel is Swayambhunath Temple, which peacefully sits on a nearby hill overlooking Kathmandu City. 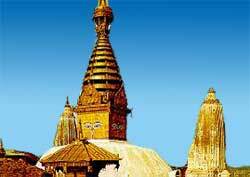 Swayambhunath Temple is crowned with a conical tower. The four sides of its base are painted with the seeing eyes of Buddha (see photo). This image has become the travel poster symbol of Nepal. These are the two other major cities in the valley - and seasoned travelers laud them. They have magnificent ancient temples and shrines - and even their own Durbar Squares. Their pace is slow, as in olden days.